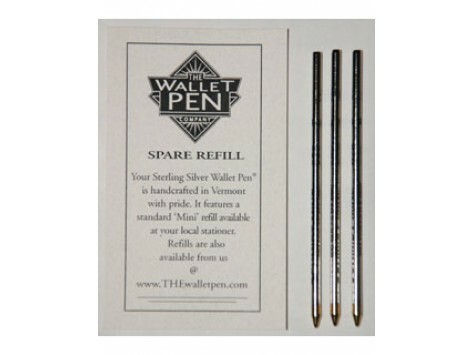 Set of 3 black ink refills for The Wallet Pen. Dimensions (in packaging): 2.5" x 0.08" x 1"
Perfect refill for the perfect pen that you should carry!!!! This is the best pen I could have purchased. I love it and want to continue using it as long as possible. In picturesque Charlotte, Vermont, in a building filled with local businesses and artisans, Tom O'Brien is making pens… by hand. Each of his sterling silver Wallet Pens is sized so it fits discreetly into your wallet, checkbook or purse without adding any bulk. It’s tiny, simple and elegant. You may be surprised that a pen could elicit strong emotions, but longtime Wallet Pen loyalists rave about its performance, utility, and the pleasure it brings them year after year. We had to find out for ourselves, and it didn’t take long to win over the Daily Grommet team. Once you experience its smooth, crisp strokes, you’ll never want to settle for a throwaway plastic pen. Plus, the Wallet Pen is guaranteed for life, so if you ever have a problem with one, Tom will make it right. Since it’s easy to tuck into your wallet or purse, you’ll always have the Wallet Pen with you to capture names and addresses, jot down a great book someone just mentioned, or record special memories while you’re in the moment. What will you (or your lucky gift recipients) use it for?